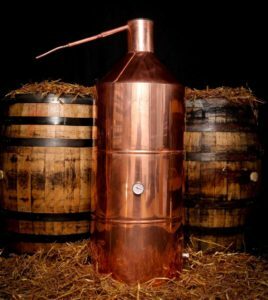 So you’ve built or bought a copper still and by now you’ve notice the outside has started to tarnish due to oxidation. No need to worry this is a natural reaction copper has when it comes into contact with oxygen, similar to when iron comes into contact with moist air and forms rust. Lucky for us this brownish copper oxide actually protects the underlying copper from further corrosion and is relatively easy to clean off. Just follow the steps below and you’ll have your still looking like this 40 Gallon Pot still in no time ! To remove paste simply rinse with water. If you really want the copper to shine and want to preserve that shiny glow you’ll need to polish it with wax or spray a coating over the still to protect it from tarnishing. Here you have two options. Get a can of Wrights copper cream and either a microfiber cloth ( polish by hand ) or a polishing machine or angle grinder ( makes your life way easier ) with a polishing pad. Apply some wax to the cloth or pad and start working the wax into the copper until it shines. Here is a video that show’s the process with an angle grinder. Apply a coat of CopperLac to your still head once you’ve finished polishing it. Copperlac is an air-dry lacquer, engineered to provide highly durable finish. They say on the company website that even a blow torch won’t discolour the coating. I’ve had great results with this on my still head but probably wouldn’t use it on a copper boiler if your using propane to heat it. If your applying this make sure your copper still is free of wax before you apply the lacquer. Now that you’ve got the outside of your still looking great don’t forget to clean the inside. I’ve but together this Guide to cleaning the inside of your new still that’s worth a read. 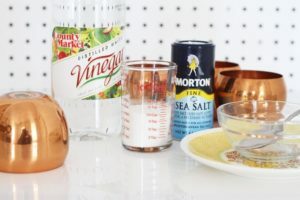 It outlines how to get rid of flux, carbon and excessive solder from the inside of a new still before you use it to make alcohol. If you’ve got a better way to polish your still let us know about it ! Tell us what products you use and how you do it! Just leave a comment below ! 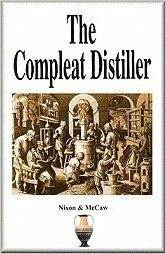 One Response to "How To Polish A Copper Still – Make That Girl Shine!" I just use ketchup and then rinse it off after 5 mins.